Beijing – IOM, the UN Migration Agency, has launched a WeChat app in China designed to provide pre-departure orientation to Chinese workers migrating to Europe. The initiative was funded by the European Union’s Partnership Instrument under the framework of the EU-China Dialogue on Migration and Mobility Support Programme (MMSP). “赴欧贴士” or ‘Destination Europe’ is a WeChat-based function embedded in the IOM China official WeChat account. WeChat is an all-in-one communications app and China’s largest social network, providing assorted services to over 900 million active users daily. The easy-to-use ‘Destination Europe’ app aims to inform Chinese migrant workers of the key aspects and processes related to their journey, starting when they leave China through to their eventual integration into a European host country. Besides providing a general overview of the European Union and key information about its Member States, the app also includes detailed sections on Austria, Germany and Italy – three key European destinations for Chinese migrant workers. Useful information relating to each country covers topics such as visa requirements and residence permits; education, health services, and accommodation; labour legislation and the working environment; money transfer to country of origin; and useful phone numbers, including emergency contact numbers. As the number of Chinese migrants travelling to Europe increases, so too does their vulnerability and exposure to the risks associated with inadequate information about migration procedures and their countries of destination. 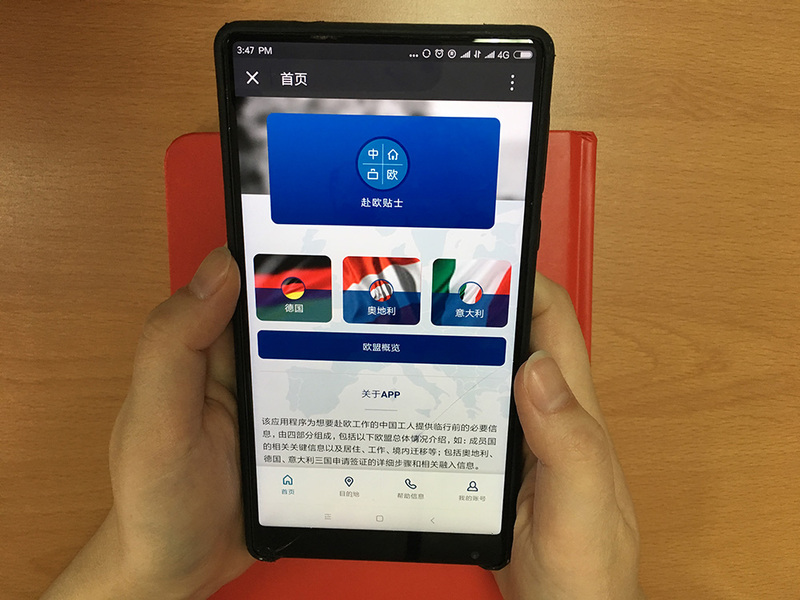 IOM China developed the app to address this issue by increasing awareness, providing practical support to Chinese migrants and their families, and making the information accessible to anyone with a smartphone.